Believe it or not, it's true. It's not really connected with the paranormal, but I thought of posting it on this board because it's so awfully morbid! Yet it's a part of Victorian history and people at present should know about it, especially the Europeans & North Americans because all of their negative history is concealed from them. 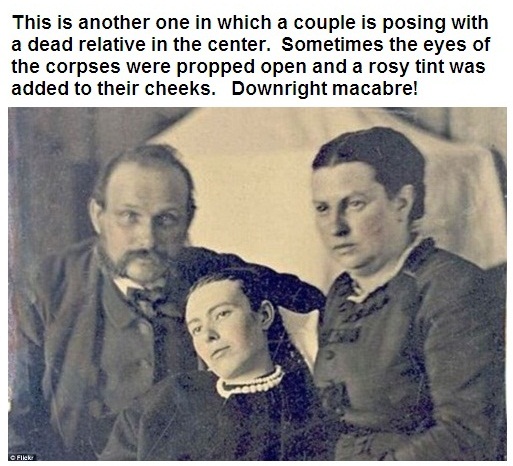 In the 1800s (starting 1839 to be precise) when the earliest photographic techniques and its process were invented, a tradition to be photographed with the deceased members of their families became common among the middle-class and elites. 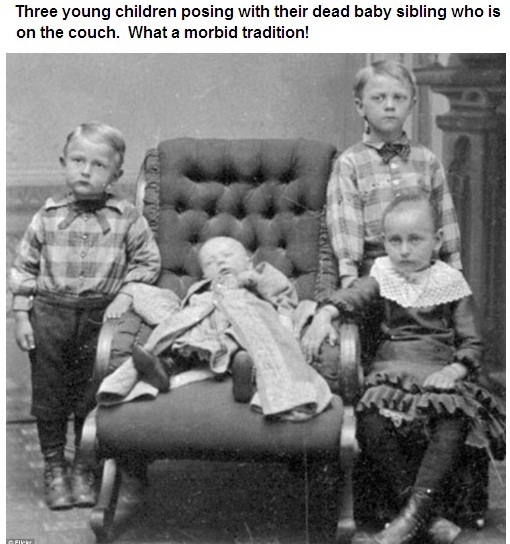 Some of the dead were photographed in their coffins while many more were propped up with cushions in couches and sofas as in group photographs with their living family members. It was meant to serve as a memento or remembrance. The practice was a lot more common throughout Europe compared to the U.S. This photographic process was far cheaper than portraits. In the Western society, it's always been about saving money. Even today, the culture of cremation that has arisen in the West is for the purpose of saving money because burial costs more. The funeral homes mint money on this business of preparing dead bodies for the funeral and for this reason they don't allow funerals to take place and leave from residences. 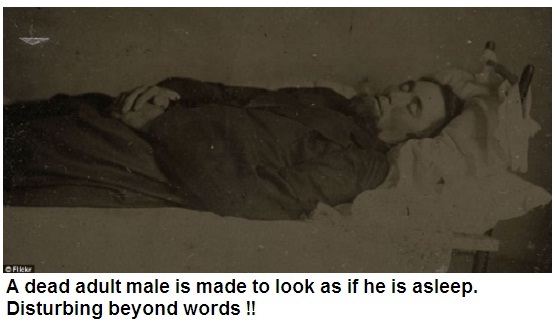 Many more real images of dead being photographed with and without the living can be seen at Daily Mail. It's mind boggling how humans get such ghastly ideas! 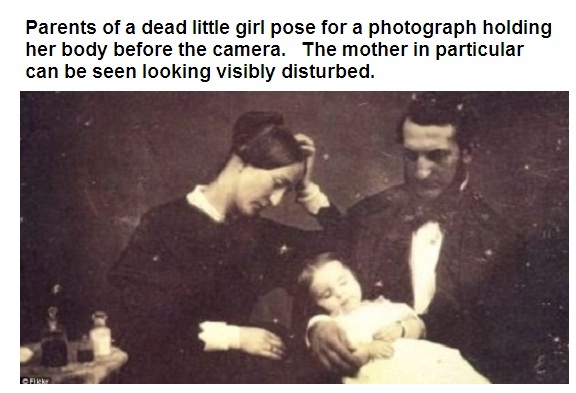 So scary Creepiest Photos !! how ridiculous ,Which kind of the love is expressed by this disgusting way ? insensitiveness of such psycho peppel have crossed all the limits of humanity ..
Yeah sis, isn't it really creepy and weird? Furthermore I don't know how one can even think of photographs when one loses a loved one .... or for that matter, at anyone's death. Such ideas basically arise when people don't have Faith in the Hereafter and they think this worldly connection is all they have, so they try to hold on to the dead to show earthly links for as long as they can. ...... In the Western society, it's always been about saving money. Even today, the culture of cremation that has arisen in the West is for the purpose of saving money because burial costs more. I would like to clarify one more point on this. It's the Christian burial in the West that are costly which requires a chain of formalities according to the rules of funeral homes. They plan a funeral ceremony like a party .... booking the room at the funeral home, visitation timings, receiving visitors on the day of the funeral, sometimes serving them with refreshments, grooming the body with make-up and fine clothes, often calling a band to play the lament, and not to mention the huge cost of the wooden coffin itself. Different coffins are made of different kinds of expensive wood costing thousands of dollars. Unlike all this, the Muslim burial only requires a shroud and bathing the body which can be done by any males in case the deceased is a man or by any females in case the deceased is a woman. And according to Muslim culture, funerals are arranged from home, no need for funeral homes. Morbid without boundaries! Don't know how they got this idea. Considering the fact that it was in the 1800s, that's not too long ago. By that time one would expect people to find such ways of showing their affection for the deceased unacceptable. You're so correct Sister Heba, these funeral homes in the West are so commercialized .... even death is made into a means to expand business. And among Muslims, offering a small space for grave at the graeyard has become an opportunity to bargain and take advantage of the emergency faced by the family members of the deceased. Where the heck is this planet heading? Everyone is locked up in their own rotting ethics. indeed death is become a business in this brutal century i agree with u sis Muslim also have become the merchants of death ,even the keepers of graveyards sell old and fesh graves in double price and that's pathetic. 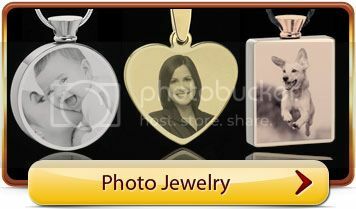 it's look like that available even for their pets ashes also !! Yeah sis, you're right, many people in the West do this. It's very disturbing. I don't know why and how? While the soul is in the custody of Allah, the remains need to be respectfully returned to dust and buried. First, they avoid the practice of burial to save money. Secondly, to make matters worse, they don't even bury the small box containing the ashes. It's mind boggling how insensitive people can become when the concept of Faith is absent in their hearts & minds. They cannot derive solace from past memories and spiritual thoughts. They only look for something tangible to cheer themselves up. They don't realize that the actual thing is the soul, the body is only the outer encasement. Soul passes away at death. The 'encasement' without the soul is not the same thing until Allah unites it with the soul on the Day of Resurrection. With their hardline secularistic mindset, they have no such concepts of the ultimate truth. Thus they comfort themselves by carrying ashes in a pendant or putting them in a bottle or vase as home decoration. May Allah Almighty guide them. 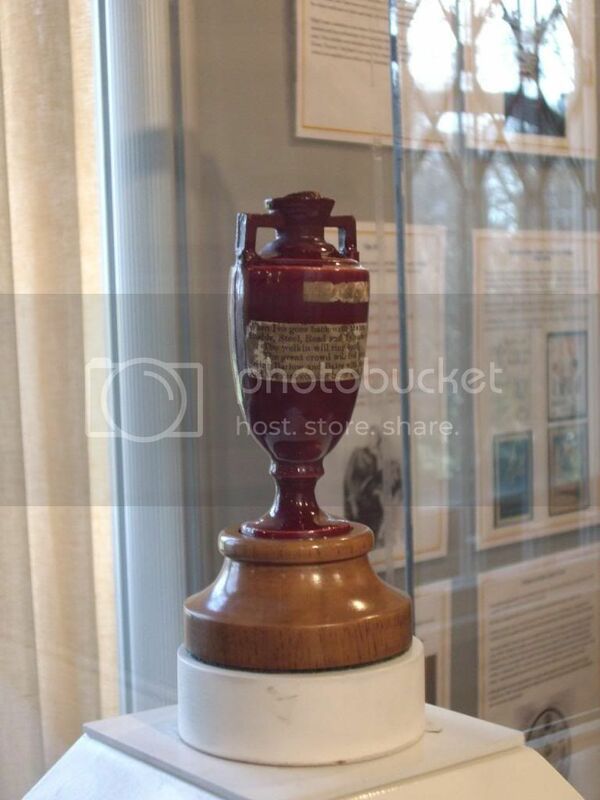 This bit about ashes is just as disturbing. All along, right from the Victorian era until now, strange ideas of the dead have plagued the Western society. There is only one reason for it - they don't have faith, they don't even think of it. This results in presuming that once they leave this world they lose everything and it also creates deep fear of death. Indeed the ignorant have been robbed of their most precious wealth - IMAN. May Allah Almighty always fill our hearts with HIS thoughts. Ameen. Completely weird and thoroughly insensitive !! In addition to having a weak iman, these people must also be having a very callous heart. Which gentle person could ever think of photo-posing and that too with a deceased loved one at the time of their death? Only a very heartless person would find nothing wrong with it.